Logo TV: August 17 2015. See trailer here. Los Angeles, California: Outfest Film Festival, July 13 2015. See photos here. San Francisco, California: Castro theater, Lesbians Who Tech + eBay, Sept 14 2015. See photos here. San Luis Obispo, California: San Luis Obispo International Film Festival, 2015. See photos here. If you are interested in hosting an educational or corporate screening, we have our film available in 25 minute, 60 minute , and 80 minute versions. We love to do in-person or Skpye Q&A sessions after the film. When Jennifer Chang and Lisa Dazols first fell in love, they vowed to follow a life of adventure. The couple had no idea that their promise would lead them to leave their 9-5 jobs, pick up a video camera, and travel to fifteen countries through Asia, Africa and South America for one year. Without any film experience, they bought a book on “How to Make a Documentary” and went in search of the people who are leading the movement for gay, lesbian and transgender equality. While interviewing LGBT leaders across the developing world they realized that their journey could have larger impact beyond just self-growth. Their documentary captures the momentous changes occurring in the status of queer people around the world today. A film in partnership with the It Gets Better Project, the joint mission is to share stories of hope around the world. Happily legally married in San Francisco, they moved to Zurich, Switzerland in 2016 where Jenni is a director at eBay. They now enjoy family life with their toddler daughter, Charlie. Jenni and Lisa started OUT & AROUND as a video web series and blog to tell the stories of people around the world who are leading the movement for LGBT equality. Jenni and Lisa were named of the TOP 25 Most Significant Queer Women by Velvet Park Magazine. Jenni was named a “Hero of the 500s” by Fortune Magazine. Jenni and Lisa also had the honor of speaking on LGBT issues at the 2015 TED Women’s Conference. Lauren has a degree in film production from USC’s School of Cinematic Arts. She directed two short films, QUIET and LITTLE SPOON which have screened in dozens of film festivals around the globe. She also won best director for QUIET at the 56.com Awards Ceremony in China. She is thrilled to be directing OUT & AROUND, a film she believes can change hearts and minds around the world. As head of documentaries for the Kennedy Marshall Company, Ryan has an active role on a full slate of projects. He most recently directed and produced Finding Oscar in collaboration with Frank Marshall and Steven Speilberg. Susan graduated from Yale University with a degree in Theatre. After starting off acting in comedy and writing content for Comedy Central, she produced an award-winning web series. She started her own production company, However Productions which focuses on issues of social justice and produced QUIET. Megan is the Director of Film Education and Impact for the Journeys in Film project at USC. She co-founded aLight Media Group in an effort to harness the storytelling power of media for social cause campaigns, particularly documentary films and human rights initiatives. She has worked with films including HAPPY, LIVING ON ONE, and LANDFILL HARMONIC to create curriculum for social action campaigns. Brett is the Communications Director with the IT GETS BETTER PROJECT. He’s assisted with the production of the Project’s Emmy-award winning MTV specials. Since then, he as supervised the production of several video and new media projects integral to the organization’s growing presence on social media. Together with the It Gets Better Project, we created the Out & Around: Official Discussion and Activity Guide which will be available for free download in English in September 2018, and in Spanish and Mandarin Chinese soon after. With this guide, you can help us bring this amazing film into even more special settings like classrooms or GSA meetings. It contains additional information about the film, discussion questions, project outlines, suggestions for further learning, and more. Download the guide below. Wonder what LGBT life is like outside your own country? Equality is not a Western Invention.Follow Jenni and Lisa’s round the world trip through Asia, Africa, and South America and meet the extraordinary LGBT leaders they interviewed around the world. 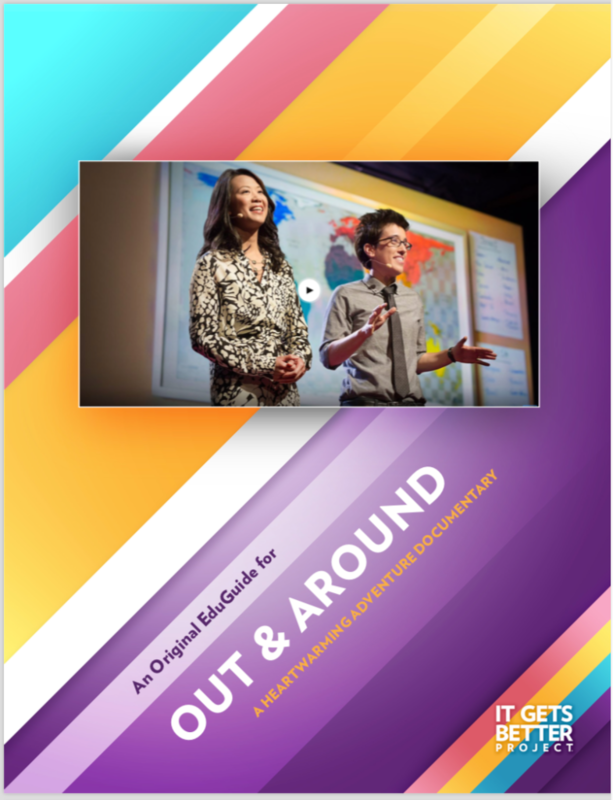 Out & Around is in partnership with the It Gets Better Project, whose mission is to communicate to lesbian, gay, bisexual and transgender youth around the world that it gets better, and to create and inspire the changes needed to make it better for them. The It Gets Better Project has become a worldwide movement, inspiring more than 50,000 user-created videos viewed more than 50 million times. To date, the project has received submissions from celebrities, organizations, activists, politicians and media personalities, including President Barack Obama, Secretary of State Hillary Clinton, Rep. Nancy Pelosi, Adam Lambert, Anne Hathaway, Colin Farrell, Matthew Morrison of “Glee”, Joe Jonas, Joel Madden, Ke$ha, Sarah Silverman, Tim Gunn, Ellen DeGeneres, Suze Orman, the staffs of The Gap, Google, Facebook, Pixar, the Broadway community, and many more. For us, every video changes a life. It doesn’t matter who makes it. Feel free to contact us if you have any questions or would like to arrange a meeting. For Press, see where we have been covered in the media here.